GRID Autosport launched during the Steam sale in June, not the ideal situation but at least they marked it down. After having some time hands on with the game though I do question if it should have gone up to full price. Granted it’s pretty, has variety in disciplines for racing and has a familiar and rounded appeal for racing fans but… the execution is where things get a bit strange. I admit I enjoyed GRID 2, it was simple to jump into and didn’t require much thought, I do enjoy car setups and minor tuning options and it was something I could just jump into. 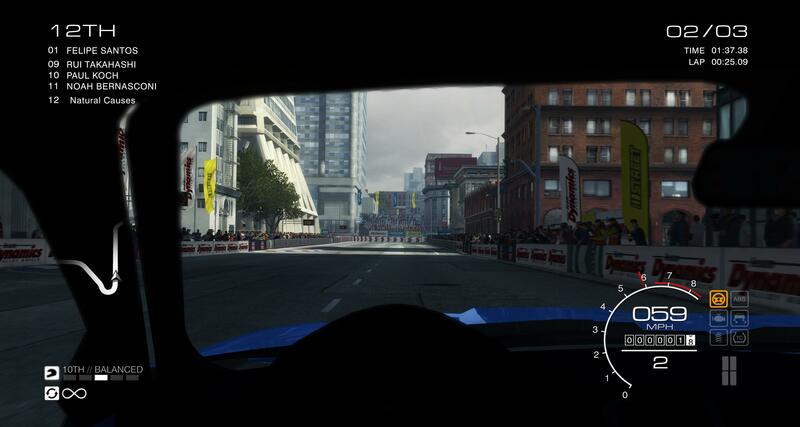 That said… GRID Autosport could offer that same appeal but the assist system really restricts the enjoyment. On top of that, things requested by the community like cockpit view have been implemented but in a limited sense, using blur and low detail models for the impression. Personally, I don’t like the cockpit view all that much, the new over the hood drivers side mount is actually very alluring to me though as the camera is no longer dead center in the car like I’m driving a McLaren F1 and allows me a bit of genuine perspective on where the car limits are instead of just guessing and using experience to fudge the corners. It’s a good catch by what seemed like a less vocal audience compared to the cockpit users. Overall the impressions aren’t awful but the handling makes it hard for new players to integrate into the game, the overbearing TCS and ASC drag the car down, I actually did a test video to showcase this. The brakes / car computer take over going into the corners and even with a high speed entry leaning for oversteer, it corrects. While this could be somewhat helpful later on, in the early stages of the game it murders the little performance cars like Golf have in the game. There’s more to explore and a deeper experience with the season mode to experience but it’s a bit of a missed opportunity as an update to the series as it lead up with so much talk about the return to TOCA and improvements. There are some around but it could have come so much further and hit all the audiences.